It's just a costume, but it's a pretty convincing one—and it's easy to find if you know where to look. If you've been playing fantasy RPG Outward, it may have come to your attention that there are some pretty cool and unusual items—weapons, backpacks, and armor sets—hiding out there in the world. Seeing as how that world is an extremely dangerous one, many of those items are extremely difficult to come by. There is, however, one very cool secret item that is easy to get your hands on, and best of all you don't need to risk your neck to acquire it. 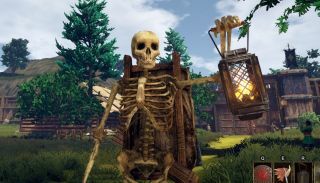 There's a skeleton costume you can wear in Outward—not some cheap Halloween outfit but one that makes you look like a real damn skeleton—and it's hidden right there in Cierzo, the safe little town you start in. All it takes is a little rooftop exploration. Start at the Blacksmith's shop. You'll see that you can climb onto his roof by running up the angled wooden beams next to his shop. Use the steps next to his work area to get started, then sidle over to the very edge and you'll be able to wiggle your way up to the roof. This is Merton's Ribcage. Grab it, and your new costume is halfway done. Next, head to Helen Turnbull's place—she's marked on your map, the woman who will buy unusual items like the mushroom shield you may have found in Blister Burrow. You can climb onto Helen's roof too, though it can be a bit tricky getting all the way to the top—I had to do some creative rolling and it still took me a few tries. Behind the second chimney you'll find Merton's Skull. Now you're all set for some skeleton cosplay. Just equip Merton bones and you'll look like an actual skelly. The skeleton costume looks great, but unfortunately doesn't give you any protection whatsoever, so I'd probably advise against going adventuring around while wearing it. The costume mostly feels like the developers of Outward knew players would mess around trying to get onto people's rooftops—tricky in a game that doesn't let you jump—and put this fun little surprise up there to reward the most persistent players.